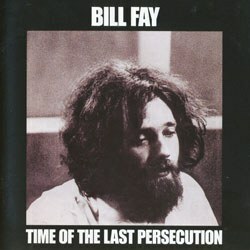 Bill Fay brought forth folk visions of a turbulent future with the enigmatic Time of the Last Persecution. In the Bible, there is an interesting story about a largely disregarded prophet named Jeremiah. Jeremiah was a prophet in Israel, before and after its capture and exile to Babylon. In a time when most people in that nation were living in what they thought was “love, peace, and happiness”; Jeremiah was walking around telling everyone that judgment and destruction were imminent. For telling the inevitable truth, Jeremiah was ostracized and out of sync with the culture around him, all the while attesting to a future doom that was yet to come. In the same vein, a largely unknown folk songwriter at the onset of the 1970s named Bill Fay released the album Time of the Last Persecution from the fringes of the music culture, heralding the end of the era of hippie idealism with messages of judgment, human despair, and eventual consummation. Bill Fay’s recording career was short, to say the least. Besides a 1967 single and two albums released within a year of each other, there is not much material to draw on. His third album Tomorrow and Tomorrow didn’t see the light of day until nearly 30 years later. Just last year, Fay released a double-disc collection of both old and new material titled Still Some Light, which featured a collection of songs from his 2009 home studio recordings. Beyond that there is not much to speak of. Although his first self-titled debut album received some notice at the time of its release (with the gorgeous song "Be Not So Fearful"), it would be his second, Time of the Last Persecution, that would remain firmly fixed in the imaginations of many, especially notable fans such as Wilco, Six Organs of Admittance, and Sonic Youth member/Wilco producer Jim O’Rourke. Very much like his contemporary Nick Drake, Fay's first release was filled with lush and classically-tinged arrangements. In stark contrast, Time of the Last Persecution employed a small group of musicians made up of bassist Darryl Runswick, drummer Alan Rushton, a three-piece horn section, and producer/guitarist Ray Russell. The sound was stripped down to a near-skeletal level (the influence of which can be felt on Wilco’s 2004 release A Ghost Is Born): dwindling piano, fiery guitar lines, simplistic drumming, soulful Memphis-style horns, and sparse classical guitar, all enveloping Fay's delicately haunted voice. Despite the stylistic and thematic shift, both records do share one common and astonishing trait: both were recorded in a single day. Perhaps one of the most interesting aspects of this album’s story is that until recently, it has been a feat in itself to even get to listen it. For almost 30 years it was nearly impossible to track down his songs and still to this day Time of the Last Persecution is not available through iTunes. Irregardless of the low-profile, Fay’s songs on Time of the Last Persecution reflect a unique spiritual reflection on the turmoil and chaos during the death of '60s idealism. Born initially out of conversations with acquaintances about the prophetic books of the Bible (especially Revelation, Daniel, and Ezekiel) as well as a fateful interaction with a book compiling commentaries on these books by ministers in the late 1800s, much of the record is a meditation on eschatology and the coming of a Messiah. Direct references to Christ’s return and the hope for a new Kingdom come down in tracks like "I Hear You Calling" (“Some say Messiah’s coming”) and “’Till the Christ Come Back” (“Hold onto your minds, ‘till the Christ comes back”), the later being a tremendous display of Russell’s raw Michael Bloomfield-inspired guitar leads that grace the record. Like the Biblical prophets of old, Fay sings with an apocalyptic fervor, speaking of a time to come, a reckoning, where men and women will give an account for their lives and human history will finally meet its closure. Songs like "Omega Day" (a direct response to the 1970 Kent State massacre when four students were killed by National Guardsmen) and "In the Kitchen", meander through dark corners of humanity and foreboding judgments of Divinity. On "Omega Day", Fay speaks of a stranger who writes down the cryptic thoughts of a man awakening from his sleep to provide proclamations of the end times: “He said, ‘my climbing rope is broke . . . better fix it son no joking, for the Omega Day is come”. With a song like "Don’t Let My Marigolds Die", Fay gives an indictment of industrialized modernity in lockstep with Marvin Gaye’s "Mercy Mercy Me". Fay’s eclectic body of work has inspired a handful of masterful songwriters and continually enthralls a strong and expanding cult following. To this day, many critics are still enamored by his short-lived and shadowy brand of folk. Fay had a knack for communicating from sizable depths in a short span of time, evidenced in the lengths of the songs found here, as the majority of these tracks are barely three minutes long. Thematically and theologically weighty (as well as unapologetically gloomy at points) Time of the Last Persecution speaks boldly to the darkness of our time, even as it lingers in near obscurity for most of the music world.